Rock Resurrection Art : What sets my guitar pick jewelry apart from the others! What sets my guitar pick jewelry apart from the others! Truth is, there's a LOT of guitar pick jewelry available out there...and by out there, I mostly mean the internet. 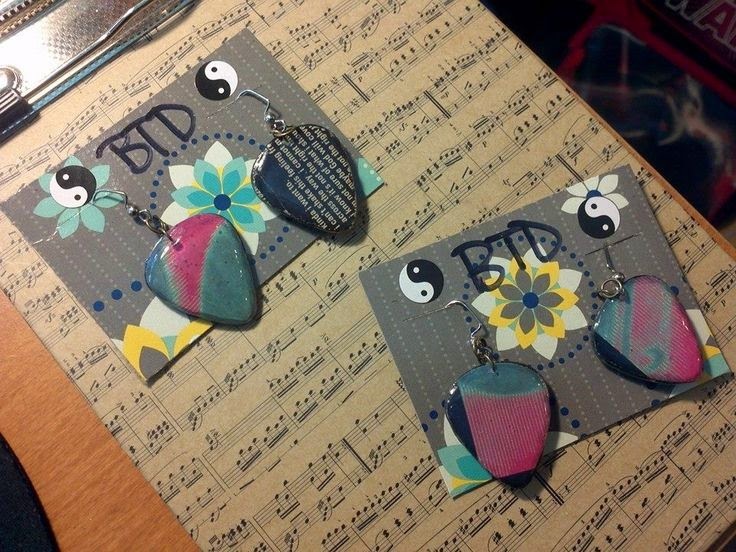 After browsing "guitar pick earrings" you will find dozens of sites featuring their hand made guitar pick wears. Lots of folks make guitar pick earrings, bracelets and necklaces, and lots of folks have them available on Etsy or their own domains. All guitar pick pendants & marketing are made from repurposed materials. Record covers, printed music memorabilia, and recyclable and non-recyclable plastic and cardboard. I don't just use plain old traditional plastic picks; I create the picks. Each piece is a work of art and is unique. Since the bulk of my guitar picks are hand made pendants, all pieces are one of a kind. Rock Resurrection's product prices and shipping are more affordable. Because my materials are repurposed, it costs less to make them, therefore I don't charge a ton. RRA has more products and variations of jewelry. My jewelry comes in many different types; more than you can usually find. Such as glow in the dark and color changing. My work is not only available online, but in art galleries and featured at craft fairs, art shows and street vending. I team up with other local or DIY businesses to cross promote and support indie creators. Easy & fast to get.